Physical activity is not my forte due to a lack of hand-eye coordination and an unwillingness to demonstrate that failing in a crowded gym. Because of this, it was kind of unusual when the school paper asked me to test our campus’s Human Performance Lab a few months ago. If there’s one thing I constantly worry about, it’s my ability to perform like a human. The HPL is a testing center where athletes go to learn how to be all they can be, and the rest of us go to find out exactly how fat we are, down to the last hundredth of a percentage point. It took some convincing because I don’t like it when anyone looks at me in the gym, and I definitely don’t like it when the people looking at me are scrutinizing my every fault. It almost made me back out, but I’m lobbying for the title “stunt reporter” and I’m going to earn it if it’s the last thing I do. I borrowed someone’s sports bra, dug out my old softball shorts, and set out for the lab. I filled out a questionnaire that attempted to explain how much I don’t move (the intern who read it gasped and said, “REALLY?”), and then they sent me to my first test. Step 1: Learn things, but only kind of listen because you’re worrying about the naked thing. 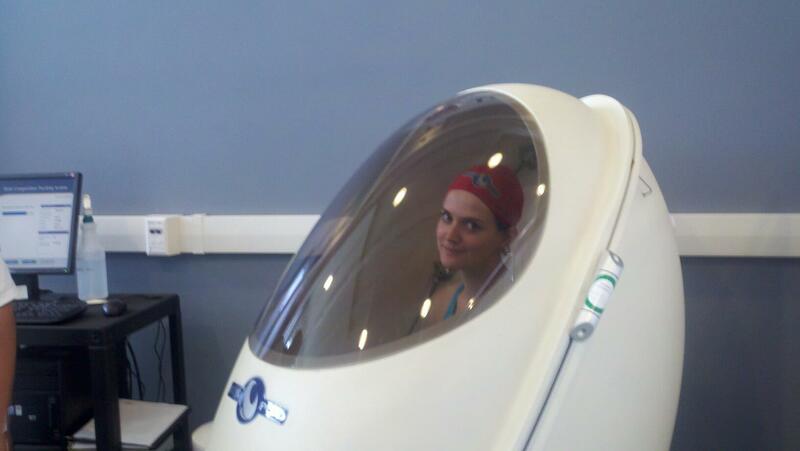 The Bod Pod is an egg-shaped chamber that uses Air Displacement Plethysmography, which is not a word I made up, to analyze body composition. It shows how much fat you have compared to fat free mass (your muscles, bones, organs, etc.) and is more accurate and less humiliating than other methods (like using calipers to pinch your fat). The test is done twice to ensure the results are close, and you have to sit very still the whole time. Step 2: Tell the person helping you about the naked rumors. Watch them laugh uncomfortably and then hand you a swim cap and a barrier to strip behind. Happily, they let me wear my running shorts and bra. I got in the egg and tried to sit still inside the chamber while air blew around me for a few seconds. It’s not uncomfortable unless the friend you brought along for moral support takes pictures of you with his phone and posts them to Facebook, which means you have to do the test three times because you were squirming around and glaring too much the first time. Step 3: Try not to cringe when they tell you how fat you are. Elite female athletes’ fat levels fall between 15% and 18%. I’m 23% body fat, which puts me solidly in the “Moderately Lean” category. I can pretty much guarantee I will awkwardly bring up this fact at a party this holiday season while I desperately try to make conversation with strangers. There are cameras in the lab that shoot 32,000 frames per second to capture every tiny movement and see exactly where the action is going wrong. I ran in front of the cameras with reflectors attached to my lower back, and when we reviewed the tape, the lab assistant praised me for running with my forefoot. Before I could get cocky, he informed me I was knock-kneed and pigeon-toed. After that, I stood in front of a thermal-imaging camera. Inflamed body parts appeared white hot on the screen. What no one told me before I walked in front of the camera is that all your warmer parts show up white hot. Through your cooler clothing. In detail. The last test for the day was optional, and thinking back, I should have said no. I should have turned the lab assistant down and made my knock-kneed, pigeon-toed way back home. But I’m a stunt reporter and a dummy, so I said yes. Step 1: Learn things, but only kind of listen because someone is wiring you to a machine. The Vo2 Max Test is designed to max you out– you run on a treadmill which periodically increases in speed until you can’t run anymore. I misinterpreted this as “you run until you don’t want to run anymore”, but in actuality, you run until you think you’re going to fly backwards off the treadmill. The machine you’re hooked up to analyzes your heartbeat, your body’s fuel usage, and how intense your training should be. Step 2: Try not to get nervous when the assistant straps headgear onto you. You have to put a band around your chest to measure your heartbeat, of course, but I wasn’t prepared for the headgear. It’s like Darth Vader’s orthodontia. A band goes around the forehead, while more come down around the face to hold up the end of a tube that goes in your mouth like a snorkel. I couldn’t swallow around the tube and I couldn’t reach inside the headgear to wipe off the drool, so I hoped no one was judging and I drooled in the name of science. The last, most claustrophobia-inducing piece is a clip that goes over your nose so you can only breathe through the tube. Then you’re off. Step 3: Try not to exaggerate when it comes to the pain scale. Since you can’t speak around the tube, every so often, the assistant will hold up a piece of paper with numbers representing “I’m doing ok” through “I want to die, just kill me quickly.” I was still jogging slowly when he held up the sheet the first time, so I just poked my finger towards 1 and rolled my eyes a little. It was like that all the way through 5, but suddenly everything was really awful. I didn’t want to run anymore, the headgear was freaking me out, and the drooling situation was out of control. I tried not to exaggerate, but I started poking at higher and higher numbers, until there wasn’t a number high enough for what I was experiencing. I made it to exactly 10 minutes before I jumped to the sides of the treadmill and tried to rip the headgear off. I went home with my results and I wrote my article. That was in September. I haven’t moved since. P.S. : For a more comprehensive conversation about the awful, awful futility of pain scales, please read this blog post. It will change your life. 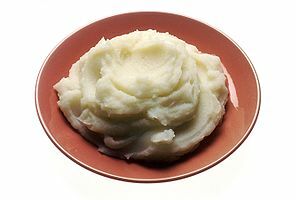 Do you have any tips for eating mashed potatoes? It’s easier if you fight the urge to make the mashed potato mountain. I know that’s hard, but it’s really the cleanest, most efficient way to do it. I’ve always been awful at buying socks. You are impressive! Why thank you! The trick is not to be intimidated by the sheer sock selection out there and to find the variety that fits your personality type. I’m a knee sock, all the way. The Bod Pod, now there’s something you don’t hear about every day…and there’s probably a very good reason for that! It sounds like a B movie to me. I sort of expected to come out looking like Captain America due to the gasses they were pumping in. No dice. I guess the gas was called oxygen? I’m still laughing at “Baby I was born this way”. (Okay fine. The. Entire. Post.) I’m impressed with the mashed potatoes. It’s totally trickier than it looks. Falls into my Embarressment to the People Who Raised Me” category. Especially when gravy is added. Be proud. Gravy really does make or break the whole mashed potato experience. As far as Lady Gaga references go, the whole thing felt like I’d imagine one of her concerts goes. There were so many costume changes. yeah don’t do so well when “Making Conversation In Elevators” as well. It’s almost always a challenge. It’s SO hard! I can’t even talk to my friends in elevators if a stranger gets on. It’s impossible. I love your writing, it’s comical and relatable. I love watching you eat sushi. That was the night that I fell in flove with you. I was directed to your blog by cristycarringtonlewis’ 7things, and I am, as ever, blown away. great wit – made me chuckle (how old an I?). Can’t wait to read more – bravo!